Who said that Halloween is just about scary stuff? How about those little (and big) ones who still want to celebrate but dislike gore? 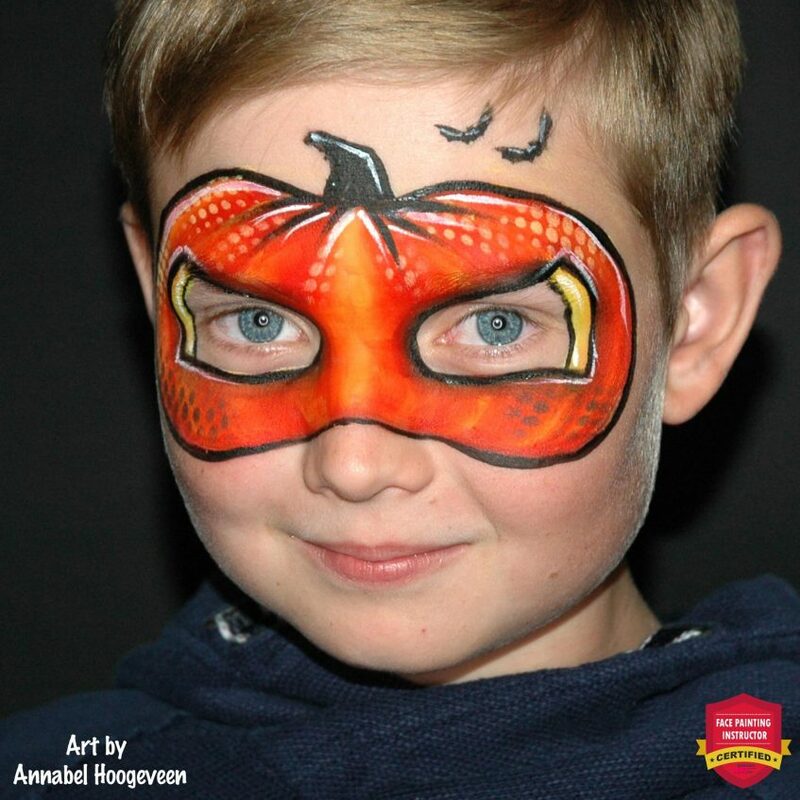 Our certified School instructor Annabel Hoogeveen prepared a super cute themed face painting tutorial for you! Another great news is that it is very fast and very easy to reproduce, so even if you’re a beginner you can surprise your clients with this stunning design! To be honest, for me Halloween is not my favorite time of the year. I get scared easily and I really don’t like painting all the scary and gruesome designs. 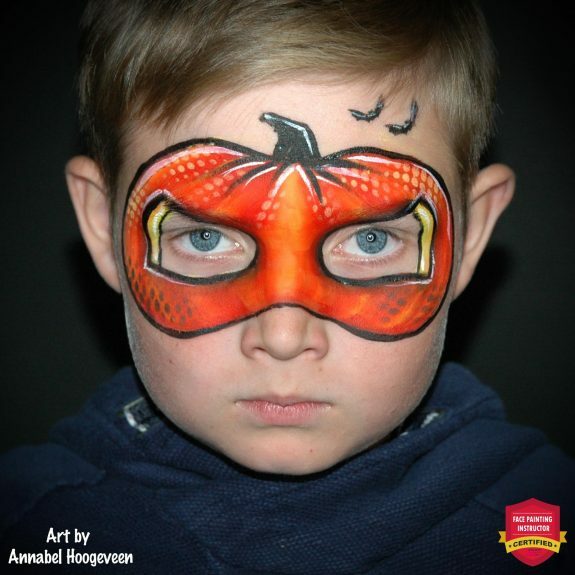 So, being a face painter and not being able to just skip Halloween, I have to come up with on-the-job designs I do like to paint. 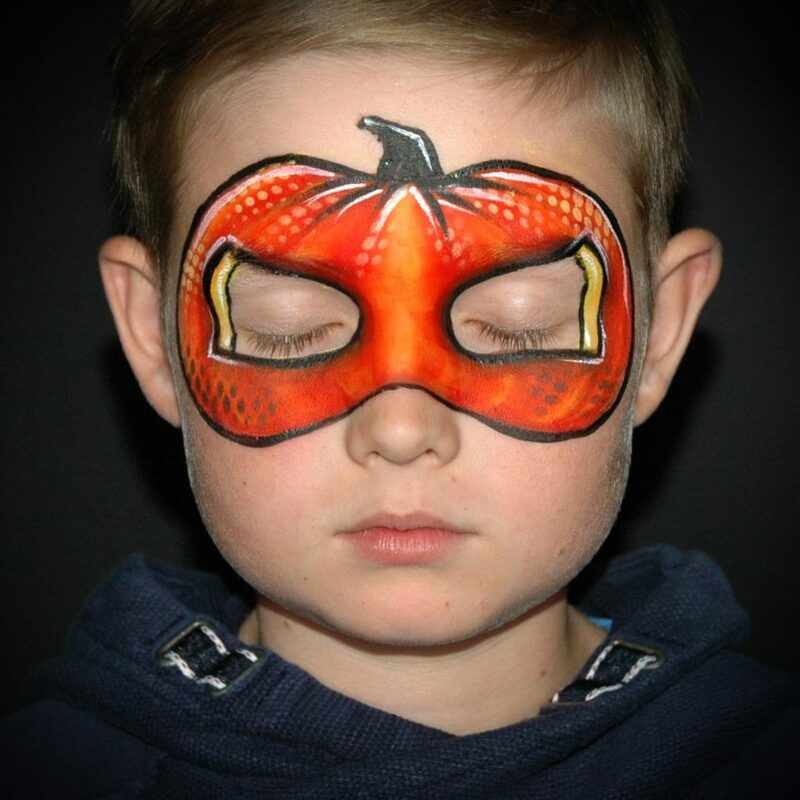 And this is one of them: a quick, one-stroke Pumpkin Mask for little Pumpkin hero’s. 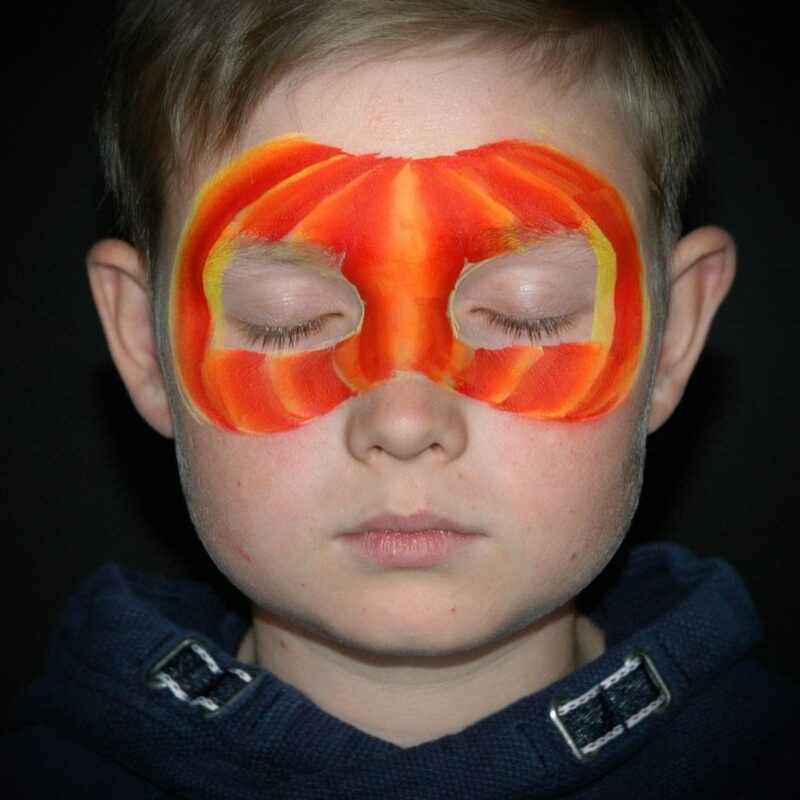 When the idea of a pumpkin mask popped up in my head, I started searching the internet to see if it had already been painted before. But I didn’t find anything that resembled my first sketch, and that seemed odd to me then. After the first attempt on my son I knew why ;-). 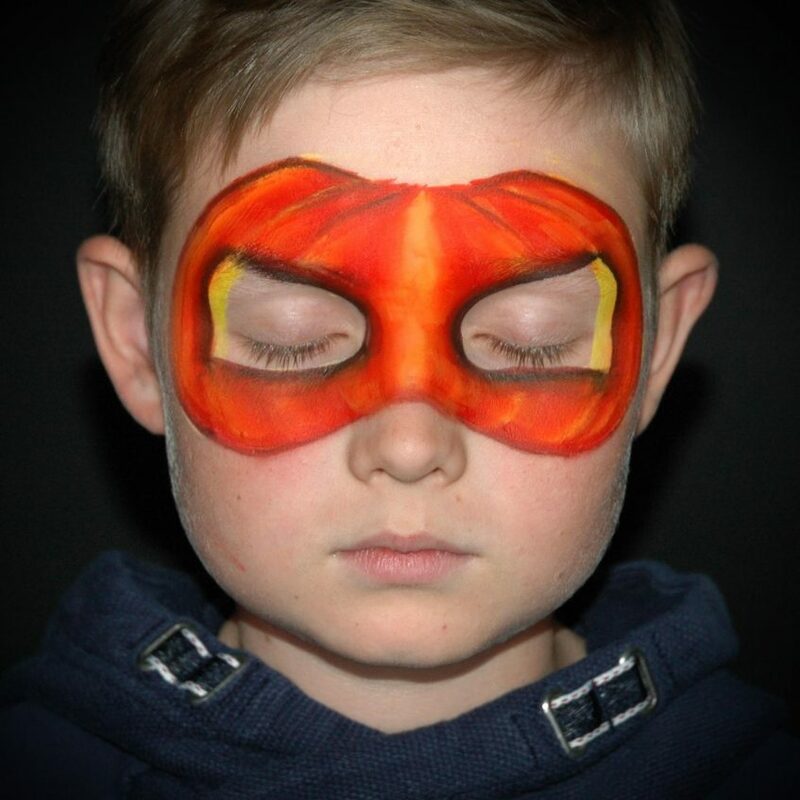 My original plan was to recreate the characteristic 3D pumpkin look using a one-stroke, in a ‘superhero’ color, blue. I choose blue because I wanted it to look ‘cool’, I wanted to make my own “Pumpkin Power Hero” :-). It looked great on my sketch, but it certainly did not look good on the face :-(. Making it look like a convex pumpkin mask, turned out to be very difficult with the concave nose and the cut out eyes. So my plans had to change: less 3D, and more original color, but still using one-stroke. 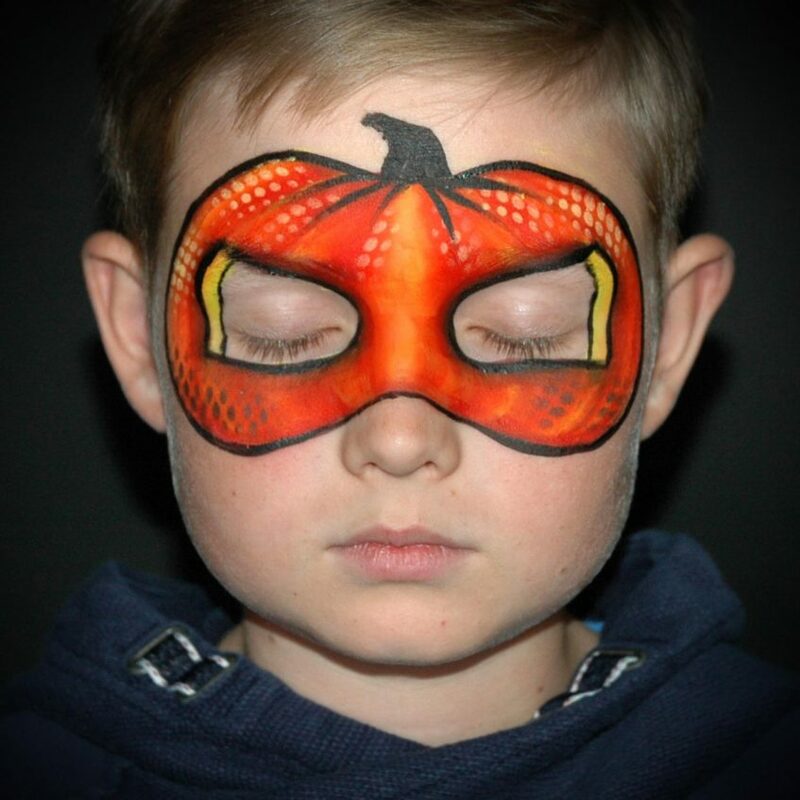 Because I wanted it to look like a pumpkin as much as possible, the outer shape of the mask was very important. That’s why I started with sketching the outlines of my design and the placement of the eyes, using a round brush #3 and a watery yellow paint. Once you painted this design more often, you don’t need to do this anymore. Using a yellow-orange-red-dark red split cake and a ⅝# angle brush paint the base. Start with the yellow lines next to the eyes. Then flip your brush and keep the light color on the outside while painting ‘bands’. For the central ‘band’ flip your brush again, so the lightest part is in the middle suggesting a convex shape. Because I don’t want the bands to be separated too much, I blend them together a bit more by going over the borders a few times. 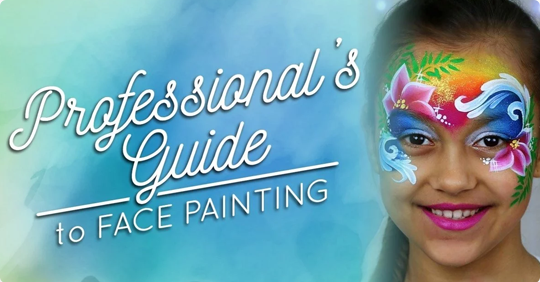 Learn how to set a career in face painting in our free guide How to Become a Professional Face Painter and Get Paid! 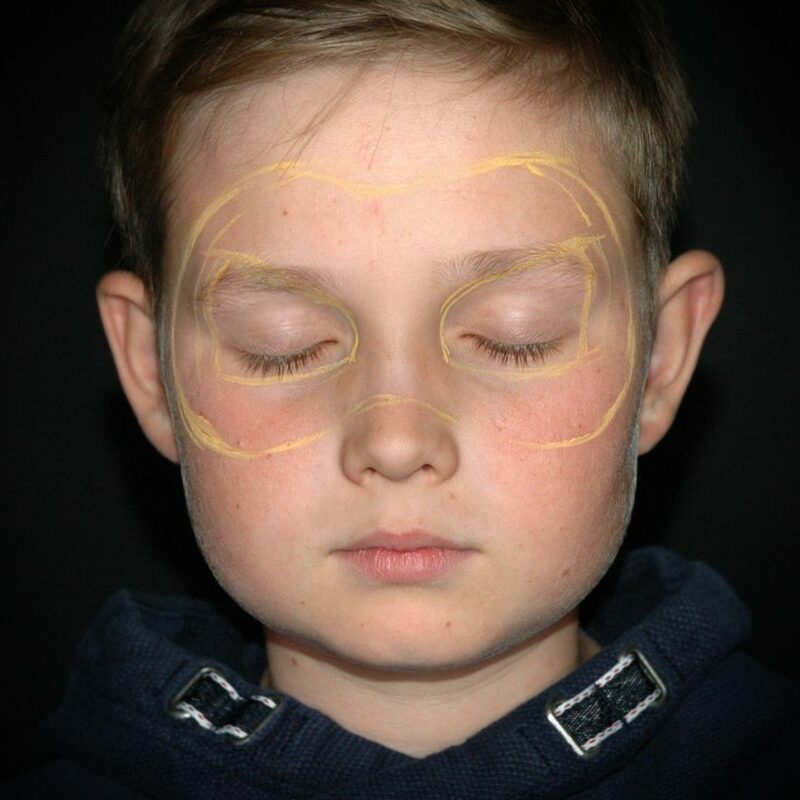 If you find it difficult to paint a nice and crisp black outline with a round brush, especially around the eyes, you can use a small flat or angle brush too. For this step, I used a ¼# angle brush and a one-stroke with black and dark red next to each other. Keep the black on the outside and blend the red into the base with your finger if necessary. Using a one-stroke for this makes the black softer and gives a bit of shading too. Add some texture using a stencil. For the top part use a light yellow, for the bottom part a darker color or black. Next paint the pumpkin stalk and the outlines with regular black and a round brush #3. If you have little time, you can finish here and leave the design like this. To make it pop a bit more, add some highlights with regular white and a round brush #3. Some boys have a small forehead, others have a bigger one. If there is a lot of empty space, you can add some bats in the background. 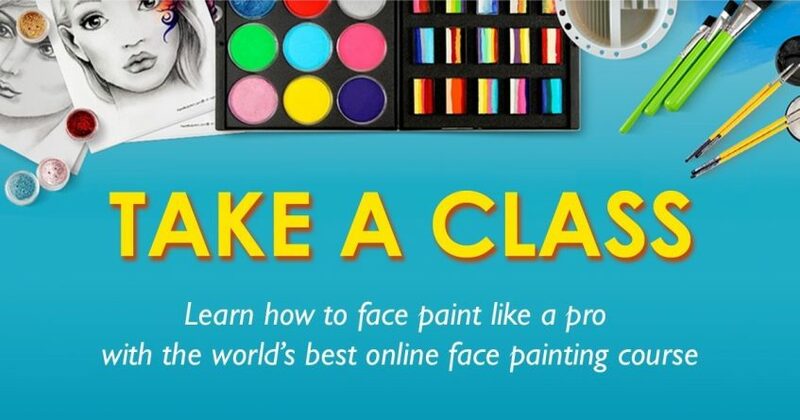 Are you looking to take professional face painting classes from the comfort of your own home? Subscribe today to receive expert tips and tricks, fresh face painting ideas, step-by-steps, and more. Are You Learning for Fun or Going Professional? 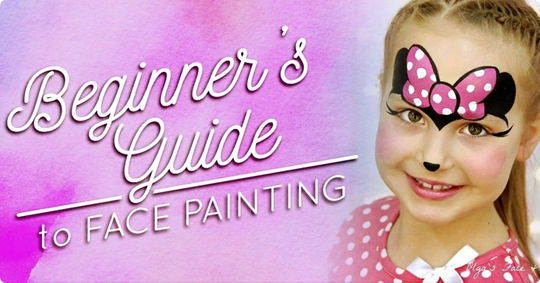 We crafted the two most comprehensive face painting guides on the internet. 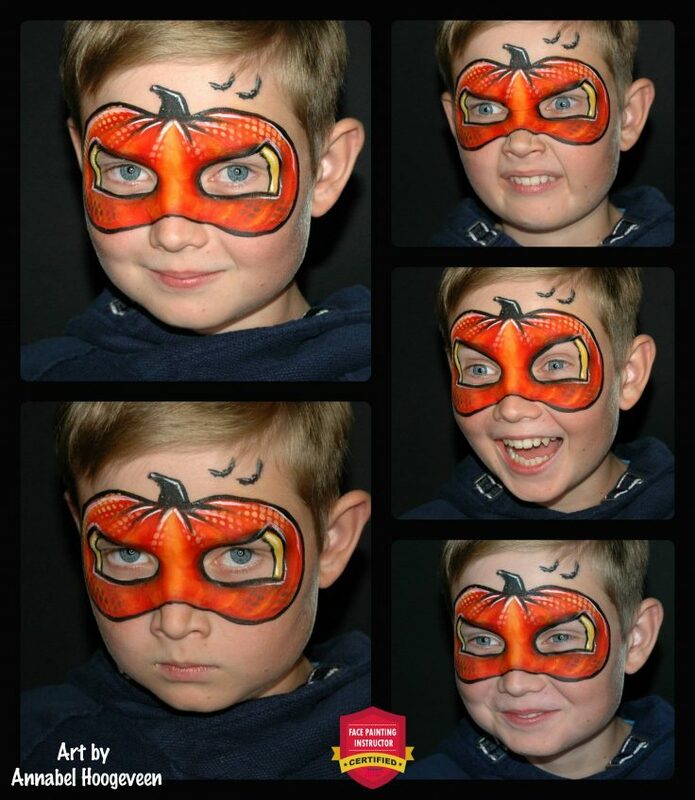 The first for beginners just getting started and the second for those face painting professionally. Choose the guide that suits you best and level up your skills today! © 2019 · FaceBodyArt.com · All rights reserved.